95th - Now on Sale! Includes 60 full color card stock counters to get you gaming ASAP. 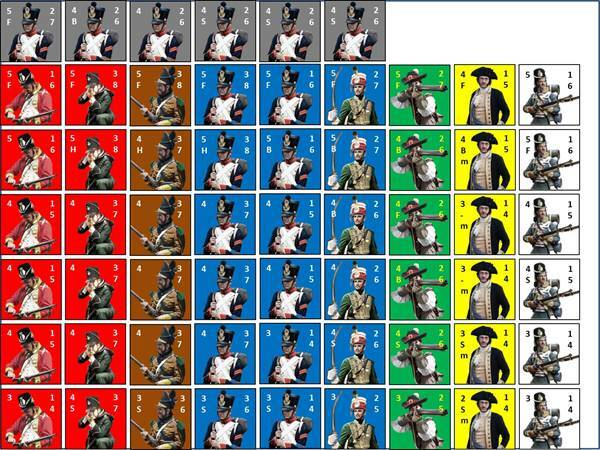 Here's the first in a series of Bat Reps set in a Campaign in the Peninsula War 1808 for 95th - Adventuring in the Napoleonic Wars. Summer 1808 and the 95th has just landed in Portugal with Sir Arthur Wellesley. Food, powder and shot is available and orders are given to move out. Sgt. William Pinkerton as been charged with leading four riflemen on a patrol in the early morning. Billy thinks it may be a good idea to forage for some food while they're out there. The Campaign year in 95th is broken down into three seasons - spring, summer, and fall. Since the British arrived in Portugal in August of 1808 I start with the summer season. The Campaign Season follows a specific turn sequence. Note that you could use this for other rules, not just THW stuff. First thing is checking for Food. Simple, I roll 1d6 on the Regular Rations Table and score a 5. Looking on the British column of the table I see they have sufficient rations for the season. If I were playing Deserters or Guerrillas I would have to Forage for Food. This is required for them, but an option for Regular Armies. Next is Supplies, but Regular Armies always have adequate powder and shot. Deserters and Guerrillas start the year with adequate supplies, but must Loot enemy figures or Pillage to get more. These can be stored and used one per season as needed. No Supplies, then it's melee only. So I have Food and Supplies; time to go on a Mission. I could choose to Forage on my own, as much as I want during the season, but will only be assigned one Mission per season from High Command. I roll 2d6 and score a 10 - go figure, Forage. Forage is similar to a Patrol Mission so I figure I'll be patrolling, but looking out for Food as well. Here's the 3 x 3 foot table I could be fighting on. 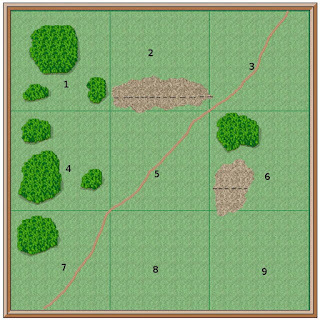 But instead of setting up the terrain and digging out figures, I choose to use this as a map to track my movement and the Battle Board option with the counters provided in the rules for combat. Billy and the riflemen spread out and make their way along a road. Suddenly Billy raises his hand and the men stop. Up ahead and within range they see four French Légère - Light Infantry. They look up at the same time, and size each other up. What to do? "Fire! ", Billy shouts and the riflemen respond. 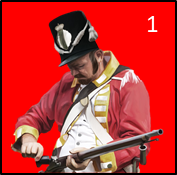 Crack, crack crack - the rifles open fire at the Frenchmen. 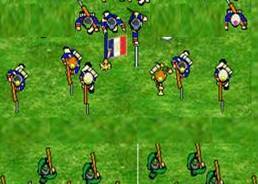 Down goes two Frenchmen, one never to rise while a third ducks back. The last soldier calmly raises his musket and returns fire. "Steady men," Billy shouts. "Reload!" The ducking back Frenchman turns and runs away. The last functioning French soldier thinks of charging, but being outnumbered, chooses to reload his musket. As the 95th finish reloading the Frenchman sizes up the situation and decides that being outnumbered 5 to 1, it is best to leave. As the Frenchman leaves the 95th move forward and search the two downed soldiers. One is dead, the other Out of the Fight. They find 2 Food units and now have a prisoner. Billy decides it's best to leave now, ending the Mission. After the Mission it's time to reap the rewards or suffer the consequences. First I forage for Food and find zero on the section we were in. But we did find 2 from the Frenchmen so the Mission was a success. That is worth 3 Increasing Rep d6. I only track my Star as the other figures (Grunts) come and go as needed. Billy receives 1 Increasing Rep d6 for killing the French soldier and 1 for taking a prisoner. That's a total of 5 Increasing Rep d6. As this is Billy's first Mission he had zero Lifetime Rep d6. He now has 5. The more you have the better you do, rising in rank at certain numbers. In addition, I use the 5 Increasing Rep d6 to see if Billy's Rep goes up. I roll all 5 and score a 1, 2, 2, 4 and 5. As none of them are higher than his current Rep, or a 6, his Rep remains the same. If Billy had ended the Mission with only Decreasing Rep d6 he would have rolled those. If one or more "1"s are scored, his Rep would drop by 1 level. The system is set to reward success and punish failure. Watch for more Bat Reps in the following days. 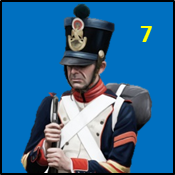 95th - The Napoleonic Wars - This time it's Personal. Following up on the last post. 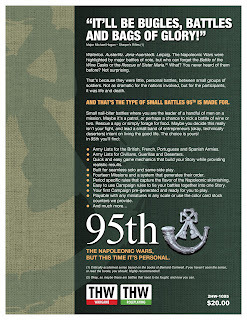 95th covers small fights in large actions. In the following picture, here's my 95th Rifles Star and four Grunts. 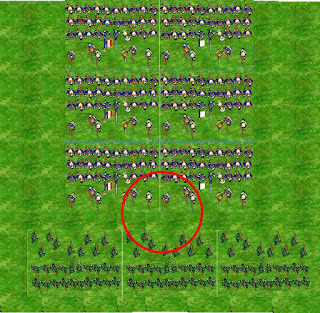 In reality there's more combatants in the units, all fighting their own battles, as the next picture shows. And here's the "big picture" of the units made up of hundreds of individuals fighting their own fight. How my guys do, reflects how the whole unit does. So, if for example, I lose and retreat off the table - that means my whole unit retreated. 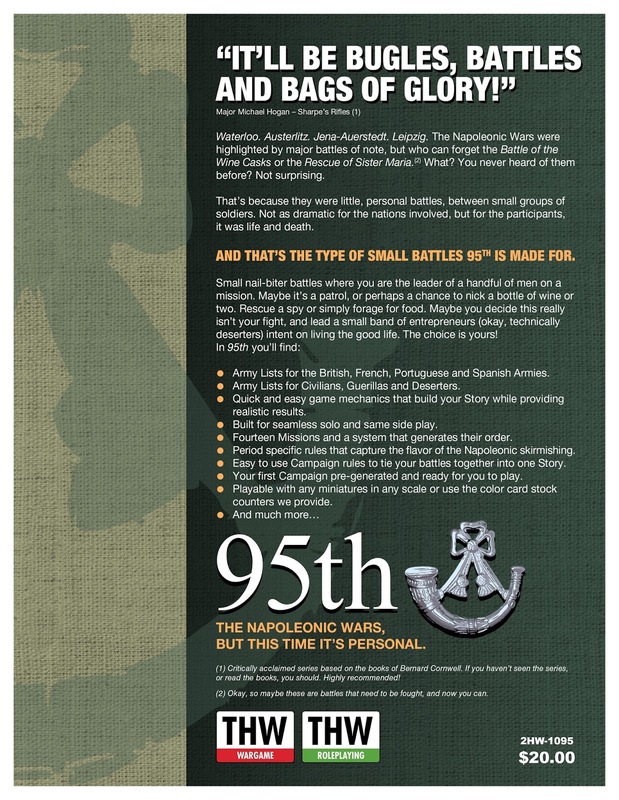 95th keeps the overall feel of larger battles, but abstracts it down to a personal level. And then there's those small fights, made famous by Sharpe's Rifles. Watch for one in the next day or two. I Want to Take an Eagle! 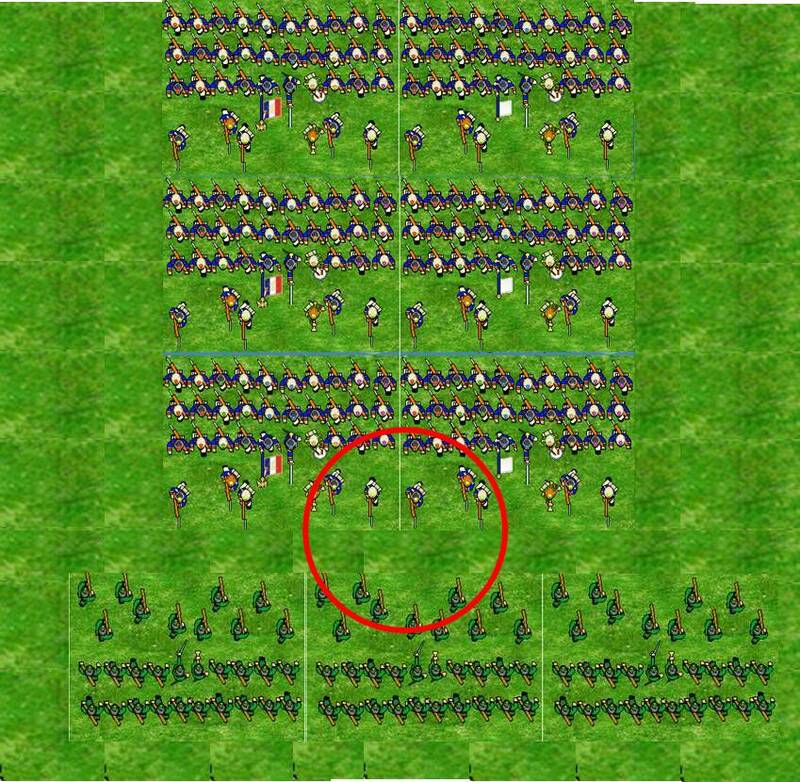 I don't want to move a unit of 12 or so figures into another unit and roll to see if I capture the Eagle when their unit runs away. 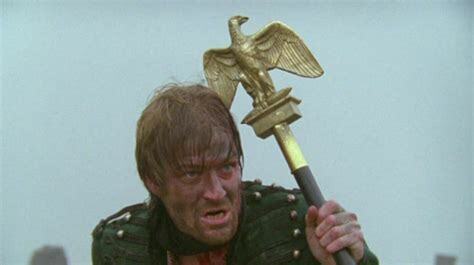 I want the units to fight, but I want to lead my five or six men of that unit into melee with the five or six guys of their unit guarding that Eagle. I want us all to fight individually against an enemy and I want to take the Eagle myself. I don't want to fight a "battle" with three or more units of many figures. There's lots of great rules out there for doing that. I want personalized fights. I want to play more than one game and link them together. I want to make a Story, MY Story. I want 95th - Adventuring in the Napoleonic Wars. Playable with any minis, counters, or even paper and pencil. 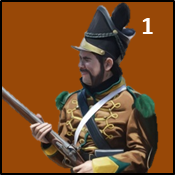 Here's some of the artwork for the card stock counters included with the game. Just waiting on three more. 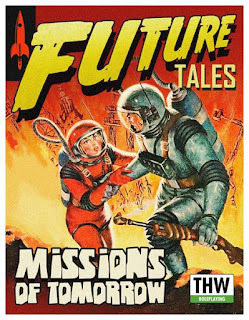 Missions of Tomorrow - Coming next week! Hers's our first supplement for Future Tales. Already have it the you're ready for Missions of Tomorrow. Don't have it? You can get it here. 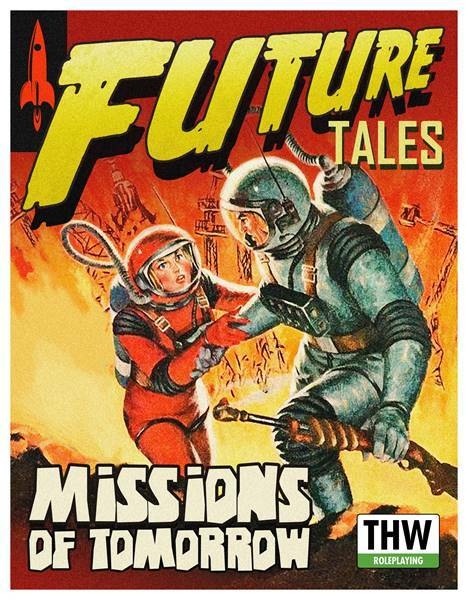 Want to play Missions of Tomorrow as a stand alone? Download Chain Reaction/2d6 Sci-Fi Combat for free and you can with just a little bit of tweaking. Heck, you can even play it with other THW rules such as 5150 Urban Renewal and even All Things Zombie! What!? How is that possible!? 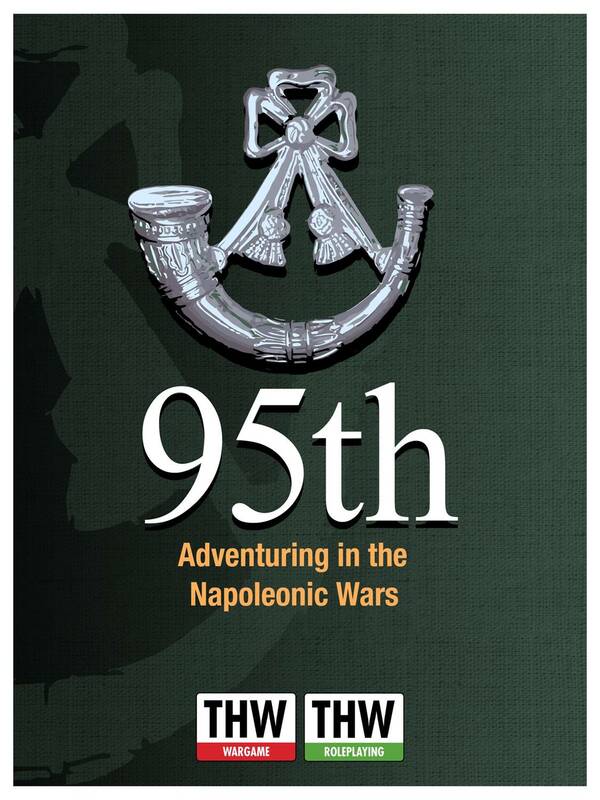 Coming soon - 95th - Adventuring in the Napoleonic Wars. We've updated the old 95th Chain Reaction Supplement and made it into a stand alone game using the latest game mechanics found in our new rules. We'll be including some simple card stock counters for your use, to get you into the game ASAP. Here are some samples. Watch for detailed AARs in the days to follow. Rumor has it that Craig will unlock all the Stretch Goals to those that pledge so they can be ordered after the Kickstarter ends. What does that mean to you? The tanks will be available and they are pretty sweet. So to recap, pledge your support of the project and you can get everything on the page before they go up in price. Here's the 1st Bat Rep. This is a Patrol Mission again. Sgt. Billy Pink leads his new Star Army squad onto section 7. Sections 4 and 6 have Possible Enemy Force markers deployed. Activation dice are rolled and Billy moves first. Rolling 2d6 versus the Bug Campaign Morale of 5 gives me 1 Bug less than the total of my force (6 squaddies + the 4 man crew). The firepower of the tank and the sqaud overwhelms the Bugs, one actually charging before it is killed. Section cleared and time to activate the Bugs. The 2nd PEF is resolved as nothing (boxcars on the PEF Resolution Table). The 3rd PEF is 10 Bugs. The Bugs lose on the Action Table and the Star Army open up. It's a repeat performance, but this time one Bug make sit into melee and a squaddie goes down. Will to Fights are passed and the Star Army activate. The Nailz 1A turns its turret and splatters the last Bug. Mission over. 5150: Bugs - Into the Tunnels Overview - What's inside? Here's an overview of the rules. Get them here and check out the Kickstarter. 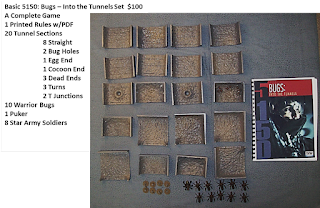 Here's a step by step AAR for 5150: Bugs - Into the Tunnels. Billy Pink is a recurring Character in THW stories over a variety of genres. "Cestus V. Ever heard anything about it?" Sooze asked. Motioning to the waiter for more drinks, she continued. "I heard it's pretty nice. About time we get a gravy deployment." Billy Pink downed the shot and smiled, shaking his head. "Have we ever had a gravy deployment?" 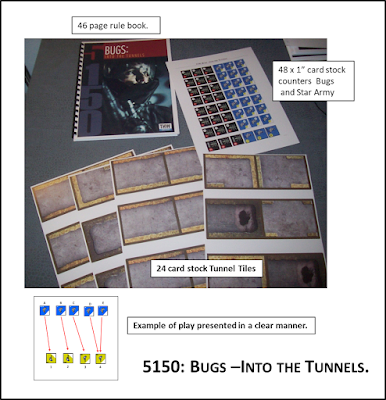 5150: Bugs - Into the Tunnels has quick and easy Campaign rules. Let's get started. 1 - Choose the Time in the Campaign. Not concerned about the year (we use 2220 in the rules) just the month, because you get two Missions per month. I'm going to use February. 2 - Campaign Morale for both sides. that's an easy one. Looking at the Campaign Morale Table we see the Bugs are a 5 and Gaea Prime Star Army is a 4. 3 - Now to see who Controls the planet and who is Contesting it. 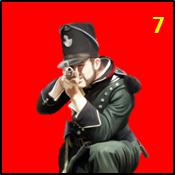 Roll 1d6 for each side and add it to their Campaign Morale. Bug total is 9 (5 + 4) and the Star Army is 7 (4 +3). Bugs are invading Cestus V.
4 - First Campaign Mission is a Patrol. By the book the 1st Mission takes place at the Space Port. 5 - Set up the table into the normal 3 x 3 foot configuration. I choose to have Billy's Squad enter section 7, the left-hand side of the table edge. 6 - Possible Enemy Force markers are rolled for and appear in sections 2, 3 and 6. That's it - five minutes and two dice rolls and we're good to go. Activation Dice are rolled and a SA 2 and Bug 5 are rolled. Bugs win but cannot move as their Rep is 4. 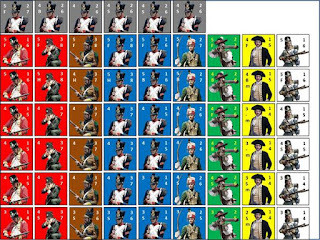 As the 3 is equal or less than Billy's Rep (5), the unit can move. I choose to move the Squad into section 4. I pick them up and place them in cover. No measuring required. Except the Activation dice coming up 7 with the Bugs scoring higher means a possible Bug Hole. 1d6 versus their Campaign Morale and a 3 means the hole appears. Not good! Rolling for How Many gives me 12 Bugs plus a Puker. As both sides have finished moving Activation Dice are rolled again. Bugs 2 Star Army 4 and here's where the bad decision happens. With the Star Army moving first, I could withdraw one section away from the Bugs and probably exit the table next turn. Except that means I've failed the Mission and Star Army Campaign Morale could go down to 3. When a side reaches "0", it loses the Campaign. I decide to stand and fight. The Bugs activate and they move into the section occupied by the Star Army. The Puker is allowed to fire first and luckily it misses. Now it's time for the Star Army to fire. 4 Bugs are Out of the Fight or Obviously Dead and one Halts in place. They continue into melee and it gets real ugly fast. in fact, only Billy survives (being a Star has its benefits) but the other 5 Squadies go Obviously Dead or Out of the Fight. Now that the shooting and melee is finished, both sides take the Will to Fight Test. The Bugs stay and Billy leaves - he was going to anyway as 5:1 in melee with Bugs...well, there's not enough Star Power to save him. 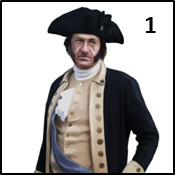 Take this test only if you were on an Attack or Defend Mission; skip this if you were on a Patrol. Guess two bad decisions were made. 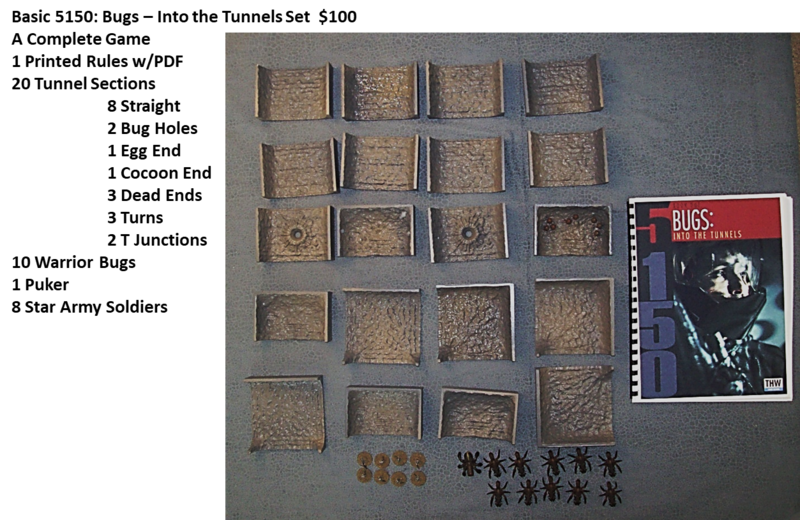 Check out the 5150: Bugs - Into the Tunnels Kickstarter. Here's the new pledge for the 5150 Kickstarter. Only $100 for 20 tiles and all the minis you'll need to play. Already bought the rules? Let me know after the KS closes and I'll replace it with one of your choice instead.